The reversible Irish baby bib proclaims: The leprechauns make me do it! This Irish baby outfit includes a onesie and bib, each with a message, along with booties. All the items feature shamrocks on 100% cotton. The green bodysuit features navy blue trim along with snaps on the shoulder and at the crotch. 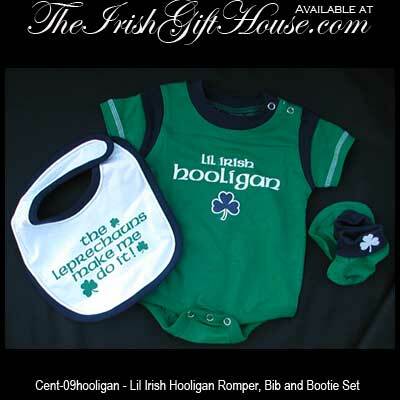 The Irish hooligan baby outfit is available in limited sizes; it is received with a shamrock history card, complements of The Irish Gift House.